I found a cool new friend today. While testing Bing translator, i sav that the Microsoft Traslator Team had created a Translator Bot for Windows Live Messenger. Outlook Voice Access lets UM-enabled users to access their Exchange 2010 mailbox using analog, digital, or cellular telephones. By using the menu system found in Outlook Voice Access, UM-enabled users can read e-mail, listen to voice messages, and interact with their Outlook calendar. 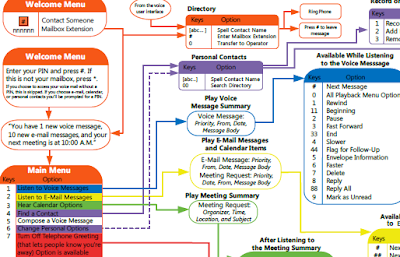 This quick reference sheet shows the navigational tree and the options that are available to UM-enabled users when they are using Outlook Voice Access. First there is the .Net Framework 3.5 witch is normally a port af the Installation process of OCS 2007 R2 setup.exe file. In Windows Server 2008 R2 the Framework is a feature and needs to be installed by the “add Feature” wizard. The PreCallDiagTool is an application that reports expected audio quality as it relates to the network effect. The tool should be installed on any desktop or laptop PC that suffers from inconsistent network connection quality. The PreCallDiagTool can provide a quick check of the current network conditions and also preserve a history of quality data to let users profile their network performance over time or other conditions. The tool is particularly useful for home/mobile users and users using WIFI access points. This means that federation with AOL users becomes part of the Office Communications Server 2007 R2 Standard Client Access License (CAL). At this time Microsoft are not expecting Yahoo to join this offer.